I met Angie, Anna and Michael a few days prior and we decided to go as a group. We woke up early as a long day of travel awaited us: several hours of driving through the Sacred Valley followed by downhill mountain biking down into the town of Santa Maria. 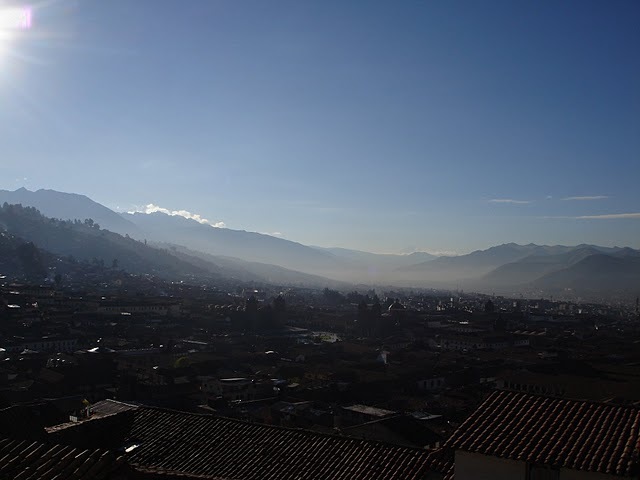 There was a real sense of adventure as we boarded the minivan in the misty Cusco morning. It marked the start of a four day trek that would take us to one of the most famous places in the world. As we drove through the rolling hills of the Sacred Valley, I couldn’t help but feel giddy. Cusco, and the surrounding area, had a habit of forming white puffy clouds that were backdropped against the bluest skies you’ll ever see. Our minivan meandered through the green valleys, climbed up precipitous mountains sides and careened through windy roads before we finally stopped. As our guides unloaded our bikes from the rooftops, we saw what lay ahead: a narrow river split a lush valley which dropped thousands of meters. Somewhere far off in the distance was the town of Santa Maria. And to get there, we were taking our bikes. Four hours later, we were engulfed in the sweltering heat of the jungle. We had descended over 1.5 vertical miles. Our arms were sore, our backs were tight, our minds and bodies exhausted, but it had been an exhilarating experience. As we found out, you don’t find the best bikes on Machu Picchu treks. My front shocks weren’t really shocks so every pebble, rock or twig we rode over reverberated through the entire frame. My brakes were a bit shot as well and it took a while before my hands stopped cramping. We took it easy the rest of the day. In the afternoon, we played a pickup soccer game with a few of the local kids and ended the day with a couple of beers and stargazing. Like the first morning, we had an early start ahead. The second day would prove to be the hardest leg of our journey. Over the course of 12+ hours, we crossed rivers, climbed mountains and passed through jungles before finally reaching the town of Santa Teresa. The 5:30am wakeup call was early but the crisp, cool, refreshing morning air woke us up quickly. After breakfast, we strapped on our day packs and began the long walk. 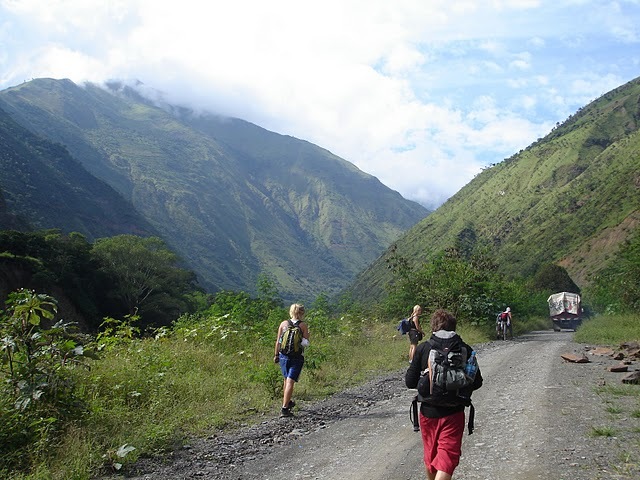 I felt like we were bravely forging ahead into the unknown, blazing a path through the Andean wilderness. In reality, we were on a well trodden path with guides who had done this hundreds of times. But for me, to be here, thousands of miles away from home, this was one epic adventure. When we started, the gravel roads were wide, narrow and flat. But as we progressed, the incline became a little steeper and the road a little narrower. The mercury also began rising as the sun inched its way across the sky. Pretty soon we drenched in sweat, slowly trudging our way through the jungle trails. Our guides stopped us from time to time to point out the flora and fauna as well as some standard touristy sights: we all “ooh’d and ahh’d” at little plots of cocoa plants scattered about and painted our faces like the Incas by using the juice of a fruit. We stopped at a small lodge around midday and had lunch. It was a welcome break as we had been hiking for nearly six hours. 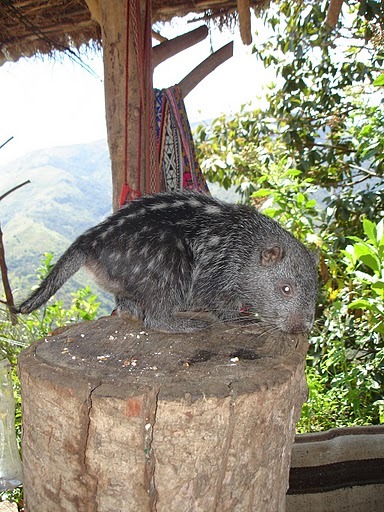 Anyone who has been on the Jungle Trek knows about the little monkey and mole-like creature that reside there. And if you haven’t played with a monkey before, you are in for a trip. I found them to be like little people, but not like kids because they are a lot skinnier and faster. When they wrap their hand around your finger, it’s the strangest sensation because you don’t expect an animal to be able to do that. They will also crawl and cling to you like you’re some sort of moving tree. After “monkeying” around for half an hour or so, we moved on. The mole-like creature at the lodge. 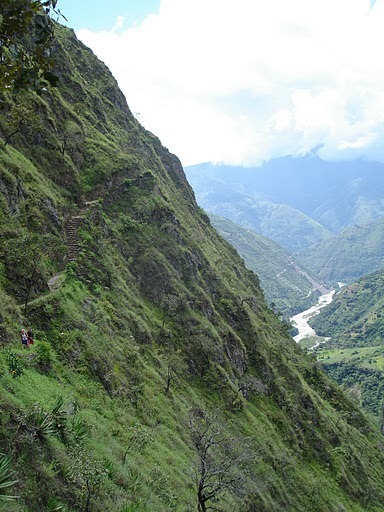 A little further up, we connected with a portion of the real Inca Trail. Here the trail dwindled down to little more than a two feet wide path cut into the mountain. On our right rose the mountain face stretching hundreds of feet up. On our left, a sheer drop hundreds of feet into the broiling river below. 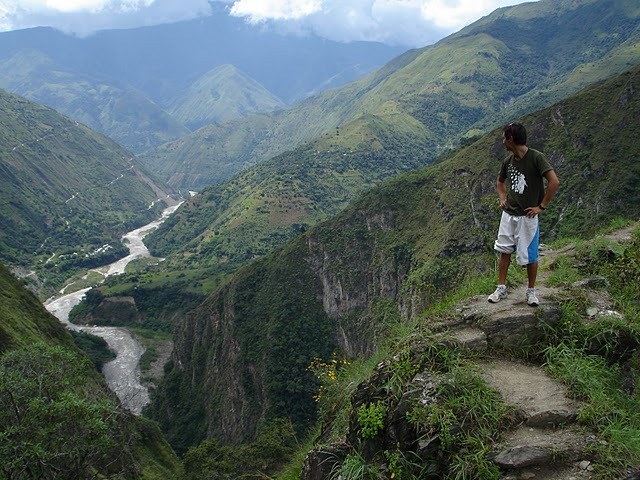 We slowly navigated through this stretch as any misstep would spell a quick end to our Machu Picchu aspirations. The path eventually widened to an outcrop of rocks that overlooked the entire valley. We all clambered over and suddenly I felt like I was in the scene from “The Lion King” where Mufasa tells Simba that “one day, everything the light touches will be yours”. 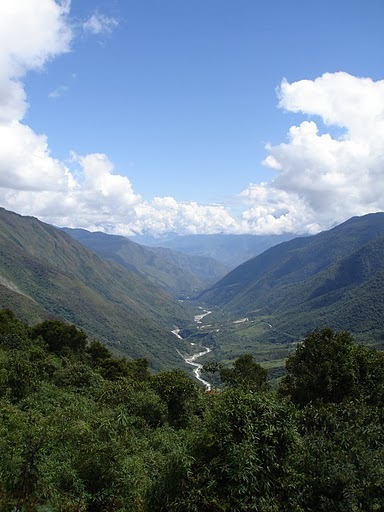 The river meandered through the valley hundreds of feet below and lush mountains stretched as far as the eye could see. The people that we could see on the trail were no bigger than my pinky. In that moment, I felt utterly insignificant, like I was but a mote of dust in the universe. Yet at the same time, I felt like I was a part of something bigger, something all encompassing. Note to self: when standing on the edge of a cliff, it’s a damn fine time to be philosophical. So from the zenith of our hike, we descended over the next few hours until we reached these natural hot springs. It was an awesome way to end a day of hiking. 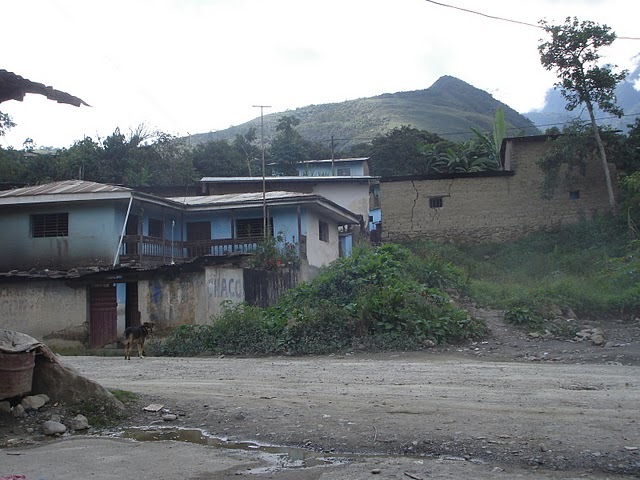 The last leg into Santa Teresa was by bus and by the time we got there, night had fallen. Dinner, drinks at the only bar in town, and a walk back to the guesthouse later, I was off to bed. Next: Eye on the prize. That is a terrific last picture. Amazing pictures! And that mole-thing is kind of cute in a weird way!